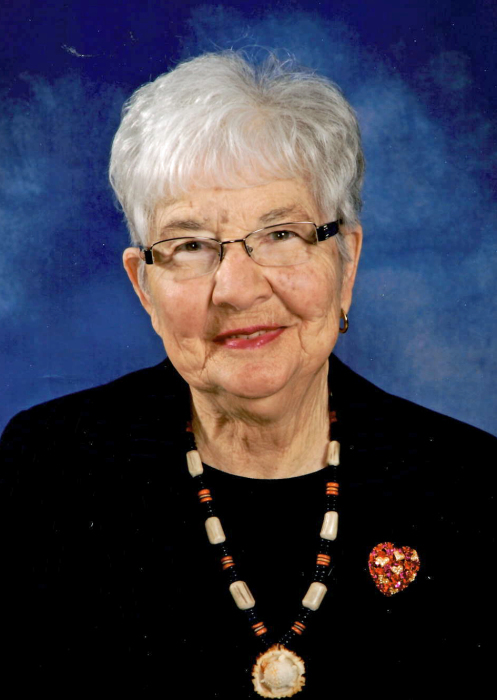 Beryl Cebula, age 89, resident of Ortonville, MN, died on March 25, 2019, at Fairway View Neighborhoods in Ortonville, MN. A memorial service will be held at 11:00 a.m. on Friday, April 5, 2019, at First English Lutheran Church in Ortonville, MN. Visitation will be held one hour prior to services. Pastor Dave Tonn will officiate and burial will take place in Wimbledon, ND, at a later date. Beryl Lauretta (Alm) Cebula was born February 11, 1930, to Harold and Florence (Patterson) Alm in Watford City, ND. The family moved to Buchanan, ND, in 1931. She graduated from Buchanan High School in 1948. She married Sanford “Sam” Cebula on June 11, 1949, in Jamestown, ND, and they made their home in Wimbledon, ND. They had four children. Beryl worked for Hamman’s Grocery and did some babysitting until she was employed by Farmers & Merchants Bank and later worked at Security State Bank, retiring in 1995. She was a member of St. Paul’s Lutheran Church in Wimbledon from 1949 until her death. She taught Sunday School, was active in Lutheran Women’s Missionary League, and was a member of the Altar Guild. She was also a member of LaBrash Altringer Auxillary. She enjoyed doing counted cross stitch, quilt making, reading, baking (especially orange rolls and cookies), and having coffee with her friends. She also loved to play games. In the summer of 2010, Beryl moved to Ortonville, MN, to be closer to family. She lived independently in the Lakeside Apartments for seven years, attended First English Lutheran Church in Ortonville, and was involved with Day of Love. In May of 2017, she moved to Harvest Trail at Fairway View Neighborhoods where she resided until her passing. She is survived by her four children: Natalie (Robert) Findlay of Tacoma, WA; Becky (Jerry) Parker of Ortonville, MN; Sanford “Sam” (Sheila) Cebula of Mankato, MN; and Robert “Rob” (Shannon) Cebula of Stevens Point, WI; seven grandchildren; and six great-grandchildren. She was preceded in death by her parents; husband, Sam; and two sisters, Ann Thoemke and Kay Bell.